Daring Cutpurse is a common Agility creature card. It is part of the Core Set. "They make it too easy." 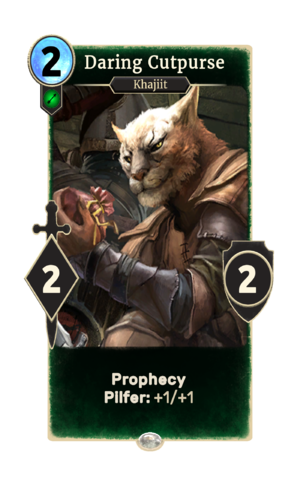 "They are no challenge for the Khajiit." "Your coin will be mine!" This card's pilfer ability applies the Light Fingers card effect. This page was last modified on 6 March 2019, at 15:21.